Is anyone else saddened by grill season coming to an end? If you live closer to the equator, or in the southern hemisphere, you probably aren’t too concerned about this. But, for all my fellow higher latitude dwellers, this can be a tough time of year. Gone are the warm nights, eating outside, and deeply delicious, lightly charred grill food. Well I am here to present you with an alternative: the grill pan. No, it cannot recover the warmer weather, but it can bring back those summery flavors we miss. Maybe you already have one, as grill pans are of course no new comer to the kitchen. I do think they get a little forgotten though. How amazing it is that these little pans can transform the stove top to a simple, easy grill. No propane, no charcoal, just delicious grilled flavor. Here is a super flavorful meal to take advantage of that magical grill pan. 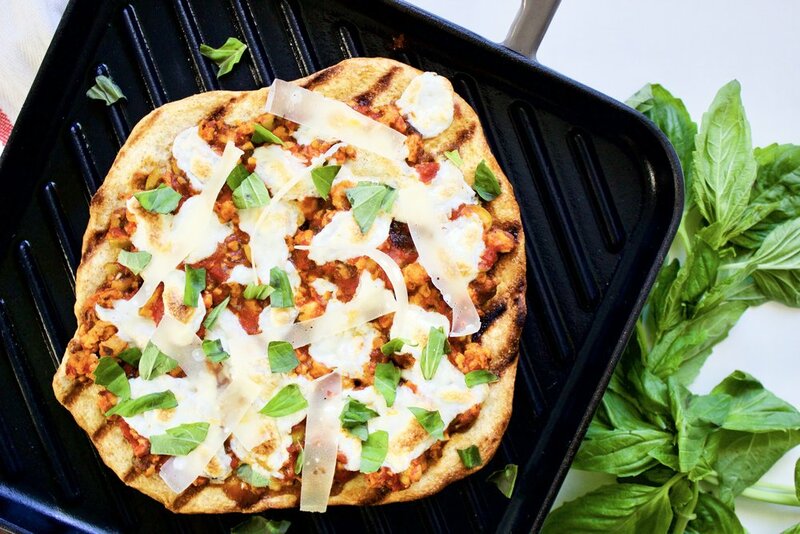 This grilled pizza is not just any grilled pizza (even though plain old grilled pizza is nothing short of awesome), but grilled pizza with ultra easy puttanesca to top it. That’s that explicitly named flavor bomb briney, olivey, tomato sauce you get on pasta sometimes. Usually it’s made with tomatoes, lots of herbs, olives, capers, and anchovies. I switched it up a bit here to make it a little simpler and more balanced. No anchovies are in this recipe, but if you like you can definitely add them or use olives that are stuffed with them. Ground chicken is added as a great source of lean protein to this other wise lower protein dish. 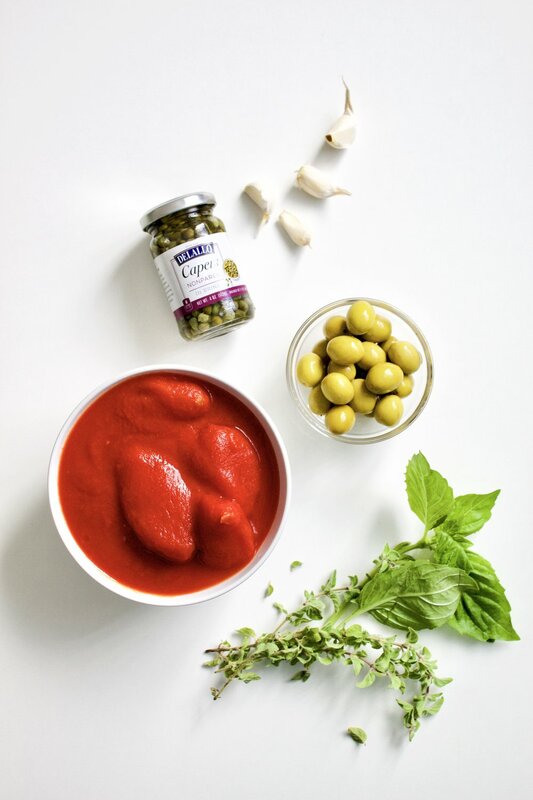 This recipe makes more sauce than for just one pizza, so you can enjoy on pasta or however you like for meals to come too. 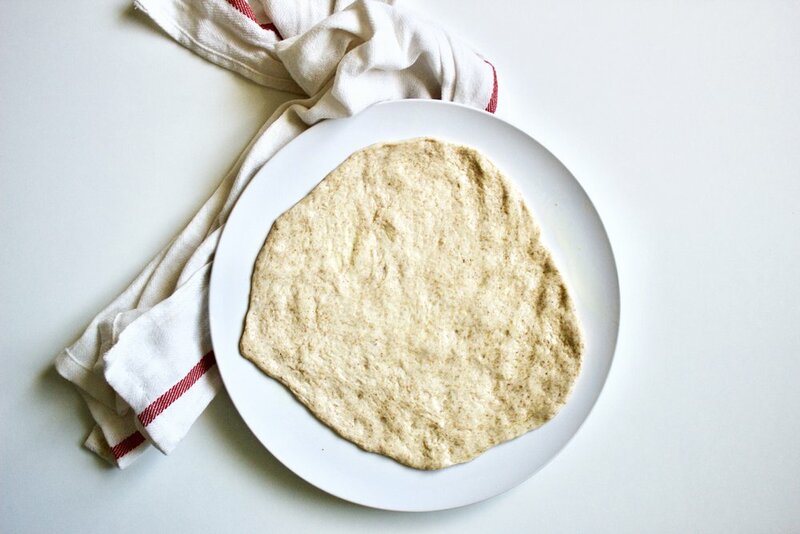 Bring pizza dough to room temperature. Heat a medium pot over medium heat. When hot, add the oil and then the garlic. Cook for 1 minute to get a little golden. Add in chicken and break up into little pieces. Add in olives, capers, oregano, basil, and tomatoes. Grind in about 5 turns of fresh black pepper. Combine well, breaking up the tomatoes if whole. Adjust heat to let simmer for 20 minutes. Remove from heat and let cool a bit. Remove from heat and spoon on the puttanesca sauce. One batch of sauce makes enough for about 4-6 pizzas I would say, but use as much on each as you like. Spread sauce evenly, then top each pizza with 1-2 ounces (28-56g) of fresh mozzarella. Place in oven and let cook 10-15 minutes, or until cheese has melted and gotten a bit golden. Serve with parmesan and some fresh basil. Repeat as needed!